No one food or drink, consumed on its own, has the power to make you lose weight. However, lime water may offer some benefit to those trying to slim down, if it's combined with a reduced-calorie diet and exercise program. Using a calorie counter app is a great trick to staying on track. Consult your doctor to discuss diet and foods that promote a healthy weight loss. If you search the Internet you may read that citrus fruits, such as limes, are a dieter's dream food because they help speed up the metabolism and promote weight loss. However, dietitian Jaime Ackerman Foster from Net Wellness reports no evidence exists that limes can help you lose weight. The only way to give your metabolism a boost is by building muscle with strength-training exercises, says the American Exercise Council. Lime water is also an excellent source of vitamin C, with the juice of one lime providing 22 percent of the daily value. Not getting enough vitamin C in your diet may affect your weight loss when exercising. Vitamin C plays an important role in helping your body break down fat during exercise, and low levels of vitamin C may limit your body's ability to break down fat when working out, according to a 2006 study published in Nutrition and Metabolism. As a water-soluble vitamin, it's important that you get a daily dose of vitamin C to maintain adequate levels. Find out more about the nutrition breakdown of limes on MyPlate. Water should always be your first choice when you're choosing a drink to quench your thirst. 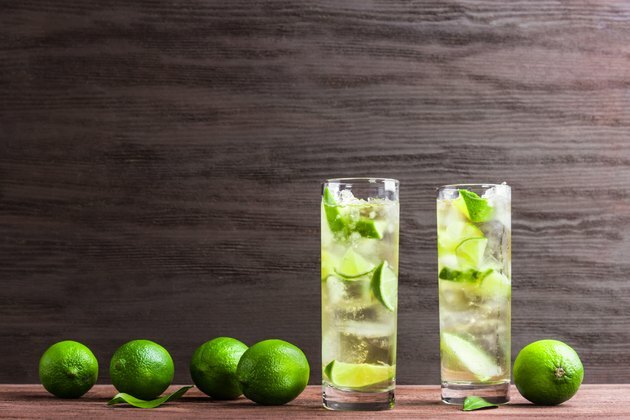 If drinking water is difficult because you don't like its taste, adding lime juice may help you drink more. And drinking more water may help you lose weight by helping you feel full. A 2015 study published in The American Journal of Clinical Nutrition compared drinking water versus a diet beverage on weight loss in a group of overweight and obese participants following a low-calorie diet. While both groups lost weight, the water drinkers lost more, say the researchers. Losing weight requires a commitment to make changes to your current diet -- beyond simply adding lime water. MyPlate, created by the U.S. Department of Agriculture, is a good tool to use to help you design a diet that's low in calories and rich in nutrients. Fill half of your plate with fruits and vegetables, one-quarter with whole grains, and the other quarter with a lean protein. Becoming more active is also important when you're trying to lose weight. Ideally, you should engage in 30 minutes of aerobic exercise, such as swimming or fast-paced walking, most days of the week. In addition, add whole body muscle-building exercises twice a week, such as use of a resistance band or free weights. Acidic foods like lime water may soften tooth enamel and lead to decay. To limit exposure, drink with a straw. Also, rinse your mouth with plain water in between your glasses of lime water. And, continue to brush your teeth twice a day as recommended by the American Dental Association.